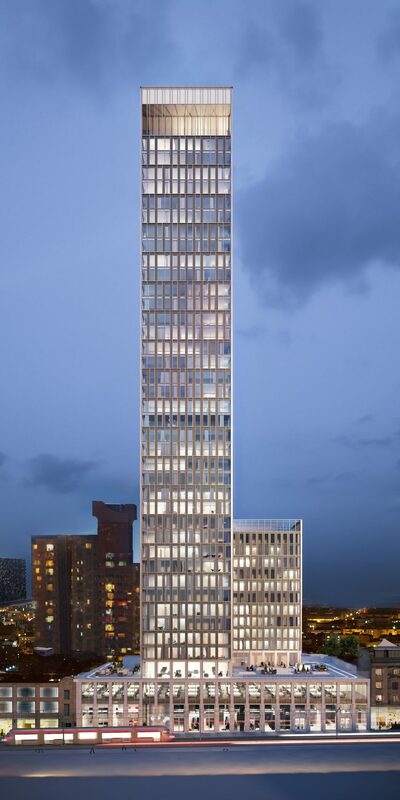 Glenn Howells Architects has won approval to build a 132-metre skyscraper that will be the tallest residential building in Birmingham, England, and will house over 480 hi-tech rental apartments. 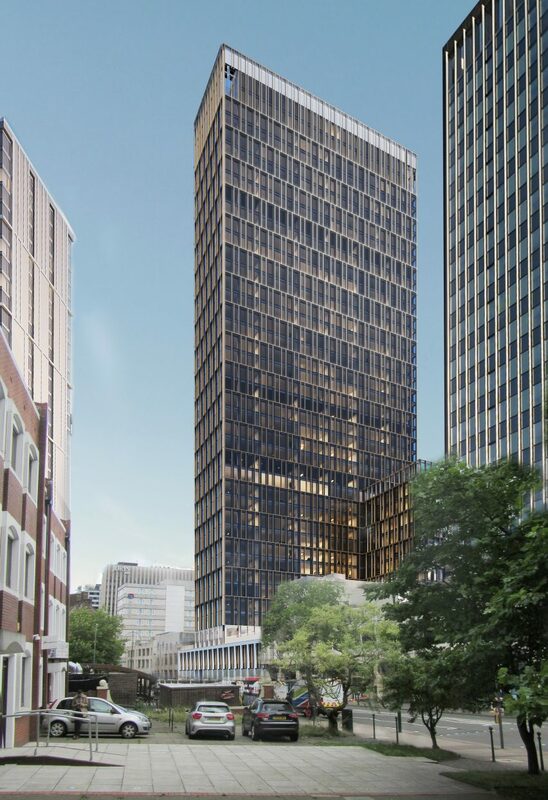 Called 2one2 Broad Street, the 42-storey tower will occupy a central location in the city on the site of the former nightclub Tramps on Broad Street. Renders show the tower with a slim profile rising above a three-storey podium, which will encompass 3,251-square-metres of retail space. The visual impact of floor-to-ceiling windows on all sides is enhanced by a facade overlayed with bronze girders that frame the glazing at double-height intervals. “Birmingham’s new addition to the skyline is an important western marker for the city,” said Dav Bansal, director at Glenn Howells Architects. A 200-metre outdoor running track is planned for the roof of the podium, which developers Moda claim is a first for a UK residential building. Rooftop running tracks have become a popular feature with architects designing urban complexes. 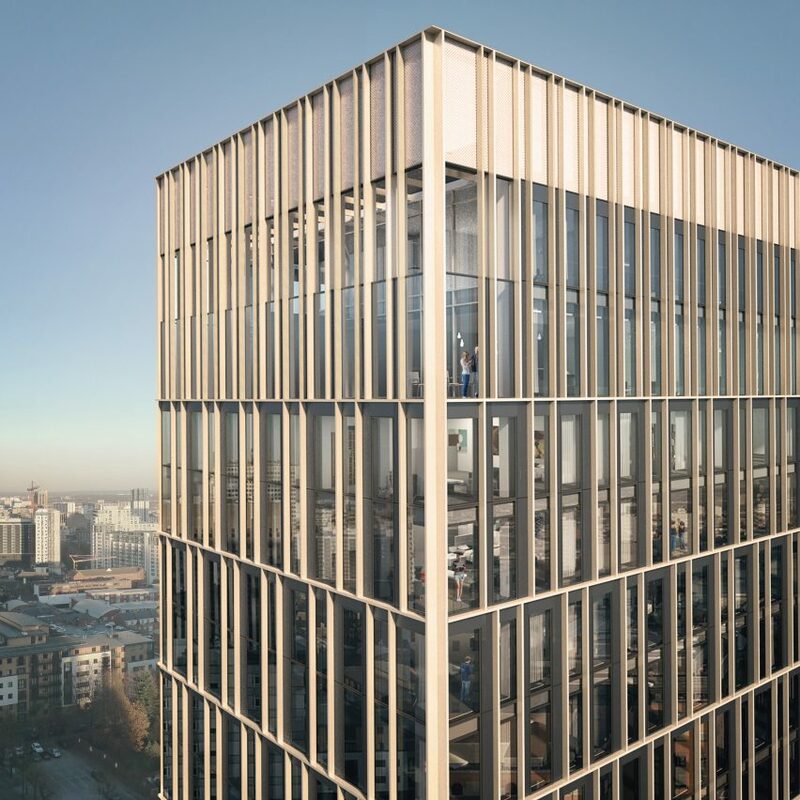 BIG and Heatherwick Studio are building a “trim track” in the rooftop gardens on top of Google’s new London headquarters, and in the Netherlands Peter Pichler Architects has designed a housing complex with two towers connected by a running track. The 481 build-to-rent apartments in the Birmingham development will also be managed Moda. The property company is aiming to reframe renting in a large UK city as a “genuine lifestyle choice”, with services catering to “today’s fitness-mad generation” and a concierge service to collect Amazon deliveries. Technology-forward Moda was the first property developer to partner with ride-sharing app Uber, and 2one2 Broad Street’s apartments will be “digital-ready”. Residents will be given access to the MyModa app, which will provide an interface for controlling their apartment’s thermostat, report any issues with a photo sharing function, and greet guests via a video linked intercom. The tower will also feature smart lifts that can sense when residents arrive and take them directly to their apartment floor. 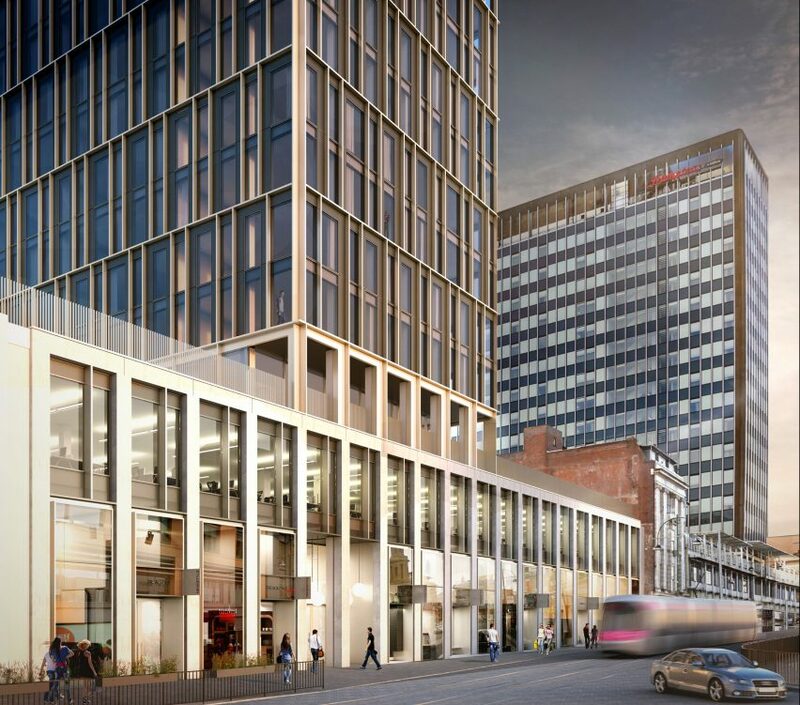 The £183 million development was approved unanimously by Birmingham City Council in a consultation lasting just 12 minutes. Currently, the tallest residential structure in the city is the 122-metre hotel 10 Holloway Circus and the tallest overall the 152-metre-tall BT Tower. In 2016 Birmingham-based Glenn Howells Architects teamed up with Yo!Sushi founder Simon Woodroffe to create Yo!Home, a residential development featuring compact apartments with moveable surfaces and foldaway furniture. Birmingham is set to get another striking housing development, in the form of Architects of Innovation’s Garden Hill development. Inspired by the Hanging Gardens of Babylon, the 500-apartment complex features two towers connected by stepped structures forming a parabolic curve inset with rooftop gardens.